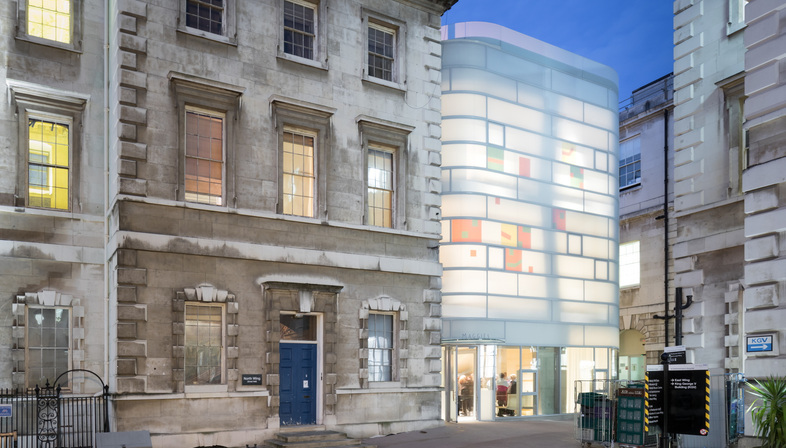 After 6 years of work, London has its’ third Maggie's Centre, constructed in the Smithfield district to plans by Steven Holl. Speaking in similitudes, Maggie’s Centres might be defined as containers of energy and optimism for the people they are intended for: cancer patients and their families. There are now more than twenty of these facilities providing operative and psychological support for hospitals in the UK, plus a number in the Far East. Steven Holl’s studio was contacted about creating a work of architecture that would provide gratification and a warm welcome for patients in the oncology department of St. Bartholomew’s Hospital, a famous London hospital fondly known as Barts. 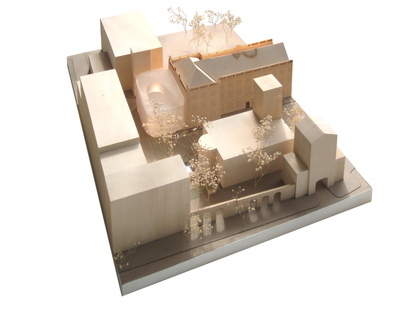 Like the other Maggie’s Centres, the Barts Centre was to stand right on the hospital grounds to ensure continuity between medical care and support. 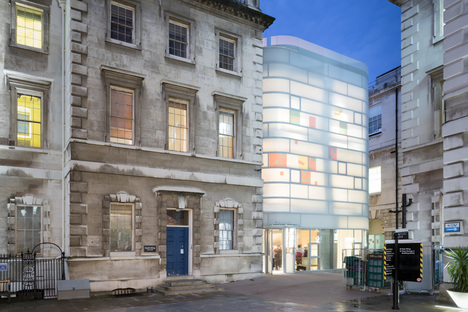 Steven Holl’s building stands in an area between the hospital, founded by the monk Rahere “for the restoration of poor men”, now located in an imposing eighteenth-century building rebuilt by James Gibbs, and London’s oldest church, dating back to 1123 and also dedicated to St. Bartholomew. 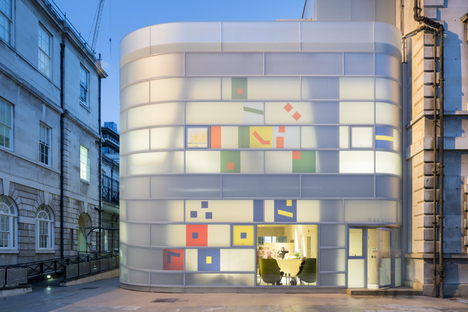 In the presence of centuries of history, Steven Holl went in search of the spirit of the place, and once he had grasped it he interpreted it using the tools and vocabulary of his own times. 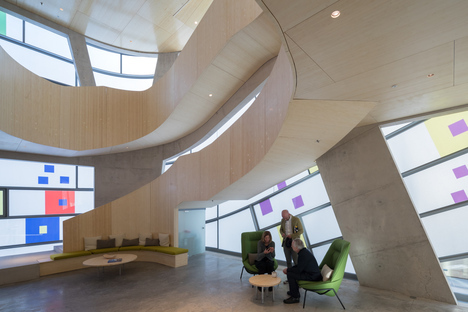 He says he was inspired by the church’s unusual acoustics, which made him think that music might provide the key to the interpretation of the new Maggie’s Centre: like architecture, music invades our living space, and cannot be ignored as it fills the space and invades our perceptive horizons. 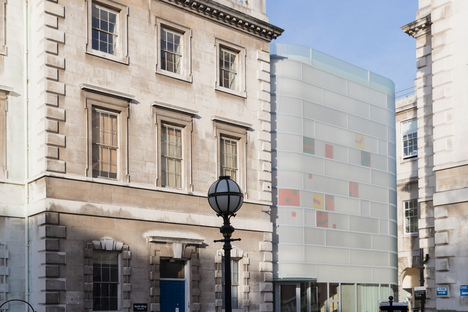 Hence the idea of reproducing the neuma in the pattern on the matt white glass façade of the new building. The neuma is a medieval form of musical notation, used in Gregorian chant, before the introduction of the musical staff. Its etymology, coming from the Greek pneuma, meaning vital force or breath of life, also recalls the concept inspiring Maggie’s centres and their mission of providing support in illness and a better life experience. Steven Holl has designed a translucent structure with rounded corners, with great lightness and dynamism, thanks to the horizontal rhythm of the metal bars on which the double-glazed glass is mounted. 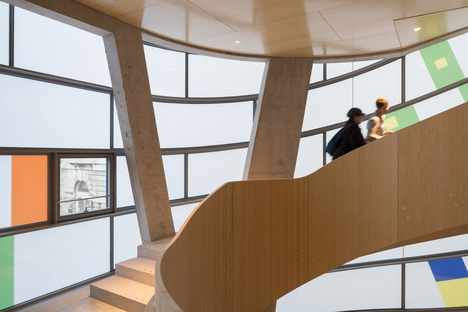 Aligned with the interior staircase rising to the rooftop terrace, the continuous façade also rises, revealing this motion on the outside of the building and creating a vortex of energy lines. In the outer glass layer are fragments of coloured glass forming a pattern that looks like a melody in sheet music. 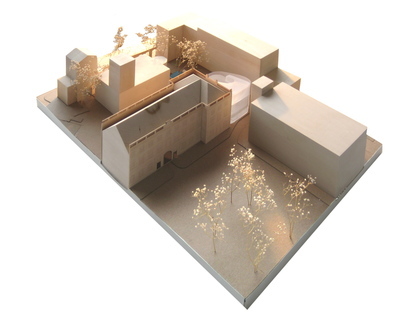 Due to the particular characteristics of the layered material, it ought to produce an out-of-focus, faded effect when seen from the outside, though the effect is not as intense as it appears in Steven Holl’s watercolours. 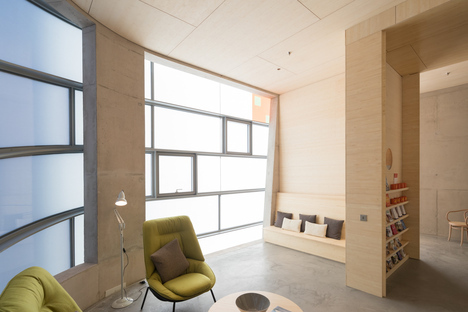 While resting against the hospital building, for which it provides an additional entrance, Maggie’s Centre sets itself completely apart from it, taking on an identity of its own and appearing almost in the round. The cornerstones emerged following the demolition of a building from the 1960s that stood on the lot, resting against the hospital building. 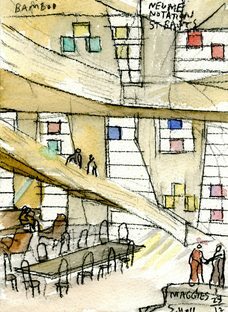 In an act of deference, Steven Holl decided to reveal them by rounding off the corners of the new volume, which “stands back” to reveal this rediscovered detail. The monumental eighteenth-century complex thus contrasts with a structure whose plasticity makes it look like an object built on an architectural scale. A façade with stone moulding and cornices is followed by a smooth, curved all-glass volume. And while the dimensional scale remains the same, the change of register is surprising. 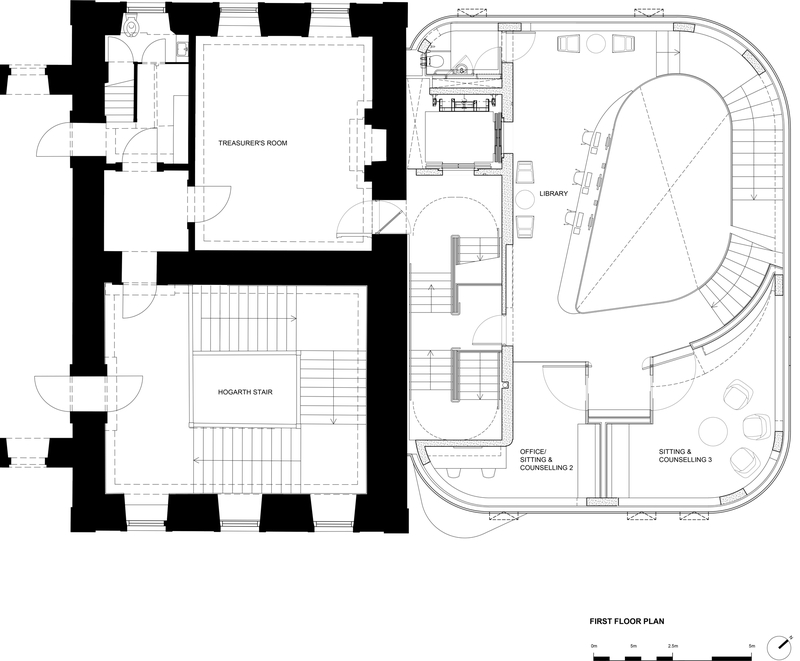 The same applies to the analysis of the interiors, composed on the basis of a Chinese box system. 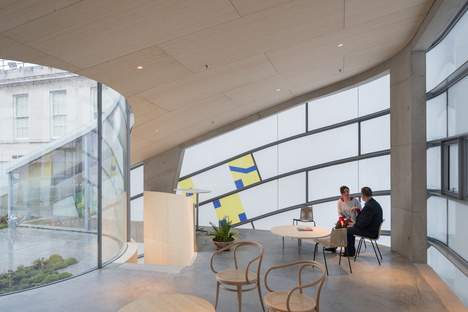 The glass skin is in actual fact supported by a concrete frame with inclined girders, within which the core consists of a bamboo wood volume. 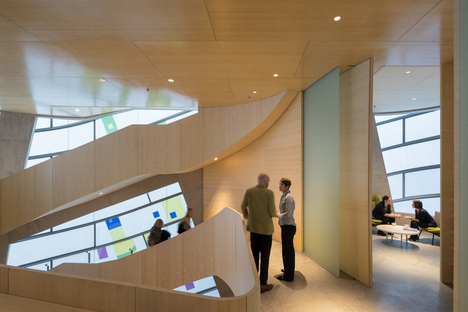 The double staircase from the hall to the rooftop garden and patio is also made of wood, surrounded by the centre’s service areas, offices, library, and areas for relaxation and group activities. 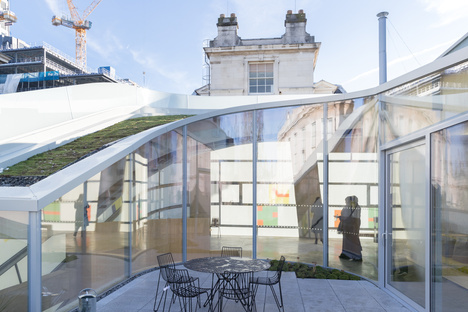 The modernity of the exteriors leads into a muffled space offering serenity, an orderly, protective world culminating in a garden overlooking the city. 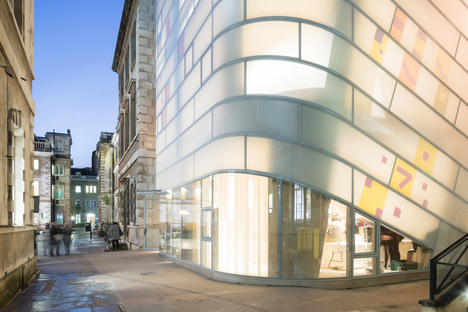 In the evening hours, when the light is stronger inside the building than outside, the architectural object becomes an urban lantern, in a lightweight architectural presence that conveys the idea of a new approach to care.